his swing on a 3-2 breaking ball from Royals pitcher Sam Runion. 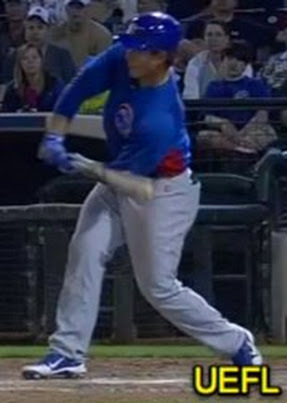 On appeal, Bailey ruled Rizzo failed to check his swing. Replays indicate Rizzo appeared to have successfully arrested his try, the call was incorrect. At the time of the ejection, the contest was tied, 9-9. The contest ultimately ended in a tie, 9-9, in 10 innings. This is Allen Bailey's first ejection of Spring Training and first MLB ejection. This is the 5th MLB (Pre-Season) ejection of 2013. This is the 3rd player ejection of Spring Training. Prior to his ejection, Rizzo was 0-4 in the contest. Ah, two ejections in one night just like old times. Boy have I missed this. Can't wait for regular season baseball to begin! The MiLB guys have been busy the past few days, Trip Gibson was working this game too and I think Rizzo for got upset with him over some call earlier in the game. Just a cumulation of things and finally Rizz had enough and slammed down the headgear. Allen Bailey working MLB Spring Training without having worked AAA ball. Been in AA Ball since 2010, if I recall correctly. One of 10 AA umpires working last night, and even 'A' umpire Garrett Patterson got into the action, too. Always interested in the development here. As far as this ejection -- I don't think he went. Saw the game on TV. But the fervor of the helmet toss warranted the ejection, without question. Bailey worked in the PCL about half way through last season. I believe he joined the staff when Tyler Funnemann retired. Russ, you're right -- just looked at the start of my 2012 notes. Nice catch!